St. Augustine, FL has quickly made its way to the top of my list of favorite cities. It has a rich history as the oldest city in the United States, stunning and well-preserved Spanish Colonial and Spanish Renaissance architecture, and the laid-back vibes of a coastal city. If you're looking for a family vacation destination that combines history, culture, and outdoor activity, I would highly recommend looking into St. Augustine. 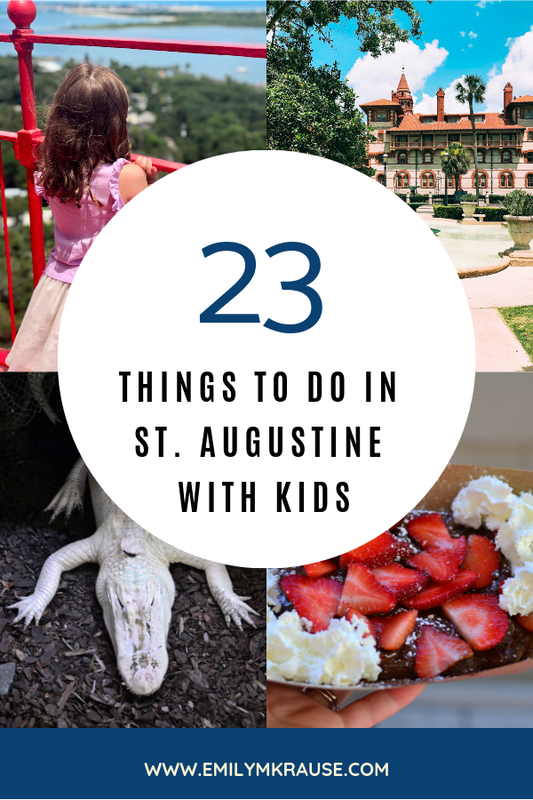 Because we are so lucky to live within driving distance, we have spent many weekends exploring St. Augustine and finding the best spots to hang out with kids. This is my comprehensive guide to the city, and I hope you find something here to help plan your next trip! Thanks to Florida's Historic Coast for hosting a few of our activities in St. Augustine. All opinions are my own, and we keep going back to St. Augustine simply because we love it! It's a great city for families, no matter what age your kids are. This post also contains affiliate links, which means if you click on my link and make a purchase, I may make a small commission at no extra cost to you. Thanks for supporting this blog! I find it especially helpful to schedule a tour right when I arrive in a new city. There are several ways to do this in St. Augustine, but my favorite by far is the Old Town Trolley Tour. It's a hop-on-hop-off style expedition around the city, so it doubles as your form of transportation for the day. It's just a bonus that you won't have to worry about parking! My kids were thrilled with the open air setup of the trolley since there was so much to see along the way. I brought a small umbrella stroller and had no problem stowing it under the seat. A larger stroller would be doable, but a bit tougher to store. Little ones can certainly sit on your lap as you all take in the sights and sounds. Get off at any stop you want, and catch the trolley at any of the designated spots throughout the city. They come by every 15-20 minutes or so, which means you're never waiting with squirrely kids for too long. Something that draws me to St. Augustine time and time again is the rich history of a city settled in 1565 and continuously occupied until the present day. There are so many opportunities throughout the city to learn about the indigenous Timucua tribes, the Spanish settlers, and all of the other nationalities that are represented in St. Augustine's history. The Fountain of Youth Archaeological Park is educational and interactive, which makes it a perfect spot for families. There is so much history within the park from the Fountain of Youth itself where you can drink the natural spring water (full of minerals and smelling like rotten eggs), to a planetarium, a weapons demonstration (think cannon and rifle demonstrations) to recreations of the Nombre de Dios Mission, the Timucua village, and the Spanish settlement. I think the Fountain of Youth will really appeal to kids who are of middle school age since they will likely be learning about explorers in school. If you have really young kids (babies, toddlers, preschoolers), there is still plenty for them to do and see. They can help dig up an archaeological site or watch the peacocks roaming the grounds. There's a lot of outdoor space, so you won't feel stressed like you might when you have little ones in a quiet museum. Yes, I drank the water from the Fountain of Youth. Am I forever young? Well, recently a cashier asked me if my 3 kids were my siblings, so you tell me. The Castillo de San Marcos is an old stone fortress located on the Matanzas River. It was used to defend the Spanish settlement against the English. You can listen in on guided tours, watch weapons demonstrations and a cannon firing, and walk through the rooms where the soldiers used to stay. There are incredible views from the gun deck on top, so make sure to bring your camera! 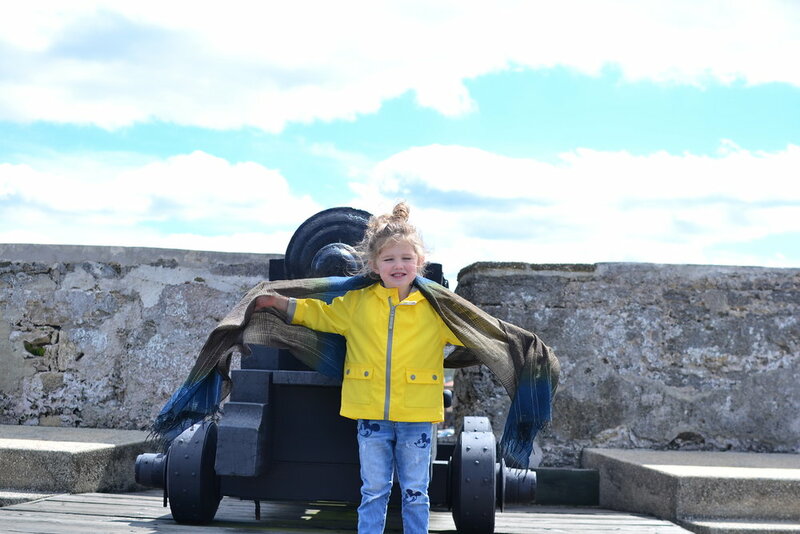 All ages are welcome at this historical fort, but if you bring your little ones, make sure to keep a close eye on them up on the gun deck, as there aren't really guardrails along the edge. My kids loved it and thought the cannons were so cool. I enjoyed the history of it all, so that's a win for everyone! If there's one thing I wish I could have done without my kids, or at least waited until they were a little older, it would have been the Colonial Quarter. My inner history nerd was fascinated by our guide's stories and fun facts. He was incredibly knowledgeable and captivating as he explained what life was like for the early colonists in St. Augustine. There are plenty of demonstrations and exhibits including a blacksmith exhibit and a cannon firing, and you walk with your guide from location to location learning about the different aspects of life in St. Augustine. My toddler and preschooler were unfortunately not as fascinated as I was, but I aspire to bring them back in a few years when they'll be more excited about the demonstrations and I can actually take the time to listen. The Oldest Wooden Schoolhouse is right on St. George Street. This one-room schoolhouse has been around since the early 1700s and is a fascinating glimpse into what education was like a few centuries ago. I had my preschooler with me, as well as my toddler in an umbrella stroller and there was plenty of room to move around. St. Augustine has a gorgeous coastline with myriad activities for families. Head to St. John Pier for a splash park with beach access. There's ample parking free of charge, and it's the perfect spot for kids to entertain themselves for a few hours while you work on your tan. 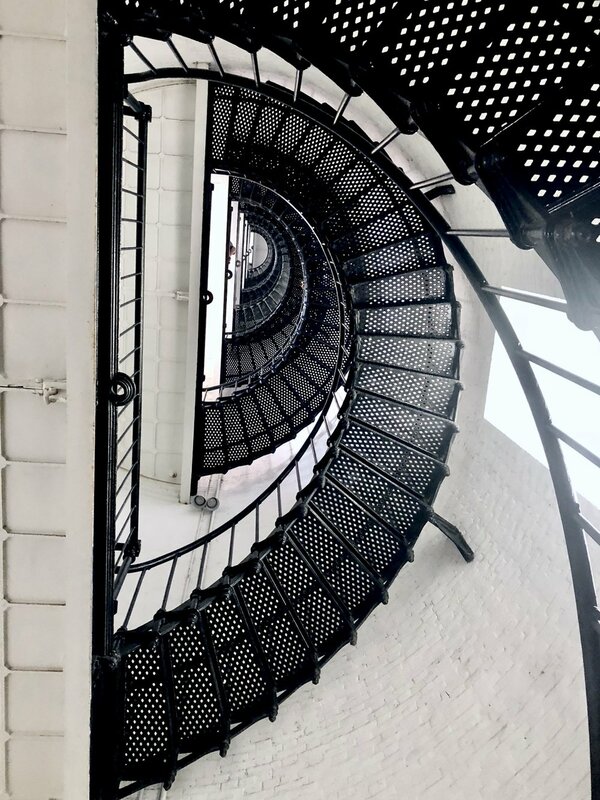 You can also visit the St. Augustine Lighthouse and Maritime Museum and climb 219 steps all the way to the top for some stunning views of the harbor. The only tricky thing about this was that my 2 youngest were too small to do the lighthouse - kids must be 44 inches tall, and my oldest (age 5) just barely made the cut. However, there is a pirate ship playground, grounds to wander, and the Old Lighthouse Keeper's house to explore with the younger kids if you want to split up and take turns climbing to the top of the lighthouse. If your family enjoys spending time outdoors, Anastasia State Park is a great spot to hike, picnic, or play. It's on the coast, so you can walk the beaches or the nature trails. Don't miss the coquina quarry! 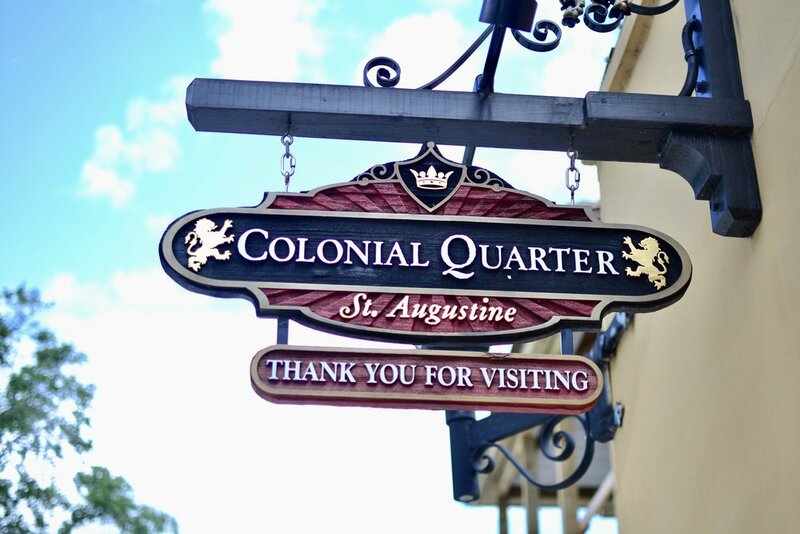 St. George Street is one of the most popular and well-known spots for visitors of St. Augustine, and with good reason. As a mom of little ones, my favorite part about it is that it's a pedestrian thoroughfare, so no need to worry about cars (except when you're crossing the street). There are shops, restaurants, historical buildings, and even spots to enjoy live music. I highly recommend stopping at the Hyppo for all-natural fruit pops, especially on a hot day. Cousteau's has the best waffles and milkshakes to satisfy your sweet tooth. Prohibition Kitchen as a great vibe and mouth-watering food. Try the poutine! A1A Burrito Works is perfect for a quick but tasty taco for lunch. Spanish Bakery & Cafe has excellent soup, sandwiches, and pastries. Check out Whetstone Chocolate for ice cream, fudge, and candy. There are way too many shops to list them all here, but I'll jot down some of my favorites. If you're looking for souvenirs, beachwear, and authentic Florida products, St. George is the place to shop. I love 360 Boutique for the boho-style clothes you can find there. The Spice & Tea Exchange is great for tea lovers. Tierra Fina & Market to Market has a great selection of beautifully painted ceramic goods. I love the coastal feel of Serenity Blue boutique. 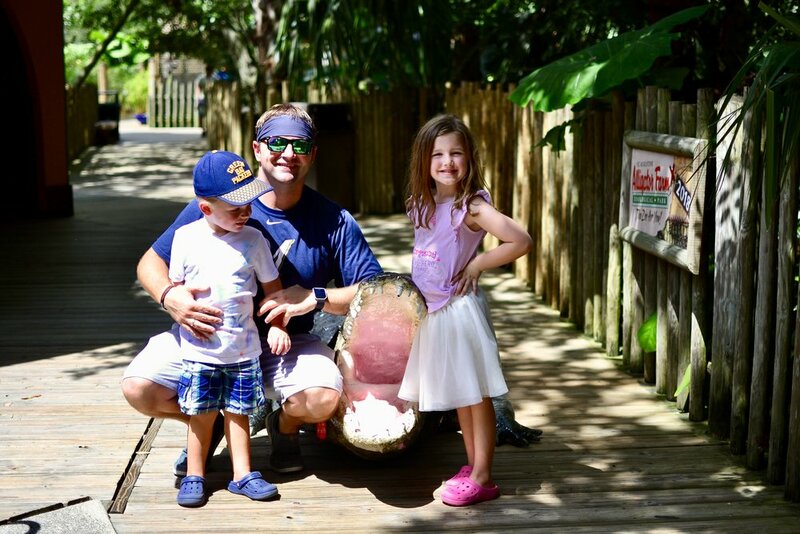 The St. Augustine Alligator Farm Zoological Park is one of the most popular stops in St. Augustine. Like the Lighthouse, it is actually located on Anastasia Island which is a little removed from the downtown area. Despite the name, it's not just a park full of alligators and crocodiles (though you will see a lot of those), but also includes birds, reptiles, and a few small mammals. There's a small play area for kids, so young visitors are more than welcome here. You could easily spend a few hours looking at all the animals, playing, and watching the feeding demonstrations. Definitely get your camera ready for the live feedings, as you'll get some great photo opportunities of the alligators leaping from the water. My kids are still talking about Maximo, the 15 ft long saltwater crocodile. We got to watch him eat some rodents during one of the feeding demonstrations, and it was honestly so exciting. You can also walk around the tank and get an underwater view of Maximo. Marineland Dolphin Adventure is the world's first oceanarium, an ocean habitat for marine mammals. You can find a sand tiger shark habitat and a few turtle tanks in the Neptune Park area of Marineland and a series of dolphin habitats overlooking the ocean. I went with my 1 and 3-year-old, so we did not get to try any of the interactive experiences (kids must be 3 or older to participate). However, we had the chance to watch a few other groups interacting with the dolphins which delighted my kids to no end. Marineland offers multiple experiences at different price points from Touch & Play all the way to Dolphin Immersion and everything in between. Even though we didn't have any interactive experiences, we loved the underwater viewing window where we watched the young dolphins playing together. When they saw us, they swam over and put on a little show, even splashing us! I was giggling and just as excited as my 3-year-old, and that alone made the trip worth it. I would highly recommend this experience to anyone whose kids have a special interest in marine life, especially dolphins. Since we live nearby, we haven't had a chance to stay in any of the lovely hotels in St. Augustine, but you can find some amazing deals at Booking.com! It's especially lovely to visit in fall (just beware of student field trips) and at Christmastime when you can see the St. Augustine Nights of Lights November through January when the entire city is decorated in white lights. It's really spectacular, and fun to take your kids on the Nights of Lights trolley tour which plays Christmas tunes while you enjoy the holiday decor. Remember that St. Augustine is within driving distance of other incredible cities like Jacksonville, Orlando, and Cocoa Beach, so you could easily plan some day trips while you're there! I hope this guide is helpful as you plan your time in St. Augustine! Our family absolutely loves this city, and I think you will, too! 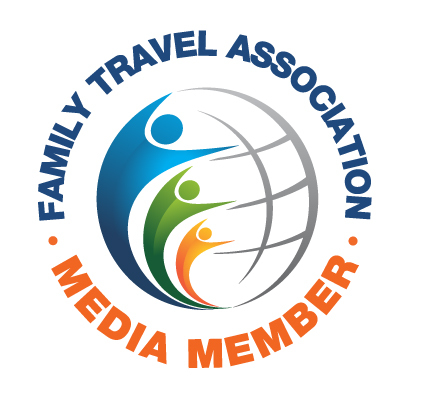 Want more family travel content in your inbox?